We felt obligated to take a day off from fundraising so we could begin the campaign to warn pregnant women. We have raised $24,889.50 from 157 donors towards our goal of $75,000 by May 31st. Thank you to everyone who has donated. If you wish to donate today, please see the details here. It would be great to hit the $25,000 mark! Even months after the event I wake up at night and worry. I can’t believe that the vast majority of citizens, doctors, dentists and scientists in the USA are blissfully unaware that on September 19, 2017, a U.S. government-funded 12-year study conducted by leading experts in the field, showed that there was a strong correlation between pre-natal exposure to fluoride and lowered IQ in children by 6 IQ points at current exposure levels experienced by pregnant women in the U.S. This mother-child study titled Prenatal Fluoride Exposure and Cognitive Outcomes in Children at 4 and 6–12 Years of Age in Mexico was published in the Sept 2017 issue of Environmental Health Perspectives, one of the most highly respected environmental health publications in the world. The study was funded by three U.S. government agencies: The National Institutes of Health; the Environmental Protection Agency, and the National Institute of Environmental Health Sciences. At the population level a drop of 6 IQ points is extremely serious. It would half the number of very bright children (IQ greater than 130) and increase by over 50% the number of mentally handicapped (IQ less than 70). This graphic is a simplified version of the graphic that appeared in the original mother-child study (Bashash, et al, 2017) and was prepared by FAN research director Chris Neurath. I can’t think of any scientific reason why these agencies have not made a public statement about these serious findings and whythey have not made an effort to warn pregnant women about the potential that such a common practice as water fluoridation could be impacting their unborn children’s brains? Nor can I think of any acceptable reasons why a government-study of this rigor and with such serious potential implications gets so little attention from major media outlets. FAN is launching a new campaign and we need your help to make it work. 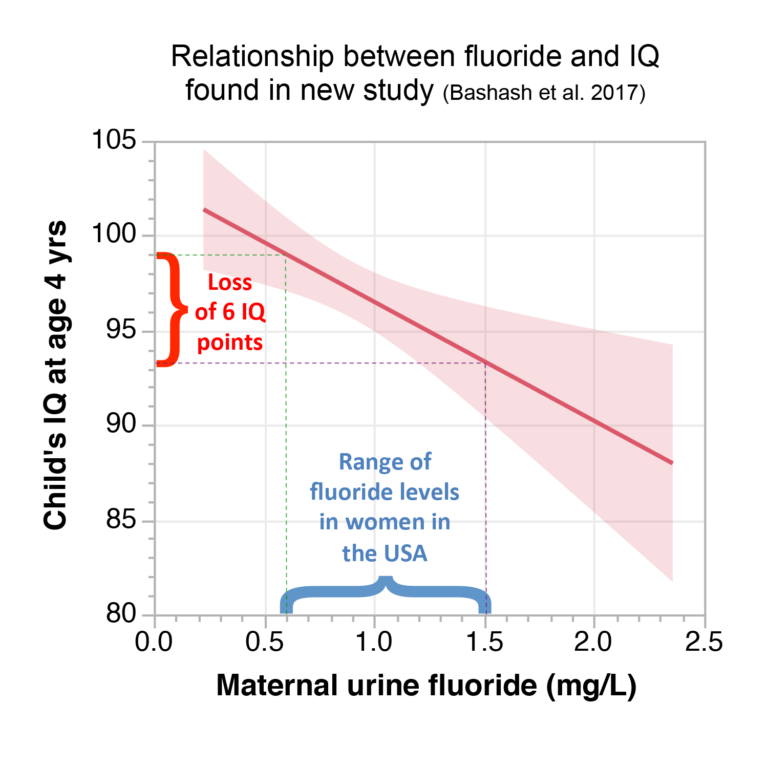 Parents and pregnant women need to know about this study and that it is the tip of the iceberg of a very large body of evidence that fluoride is neurotoxic. This includes over 300 biochemical, animal and human studies – and critically – 52 (out of 59) studies that have found an association between loss of IQ and higher fluoride exposure. Please share this warning with every pregnant woman you know. Please work within your community by forming a group (if you haven’t already done so) to strategize on the most effective ways to get this message out. Ask your City council to place a moratorium on fluoridation until this issue is settled. Write letters to the paper, put up posters in public spaces, hand out flyers. Make a formal appointment to meet with either your city health department or county health department. Request that they issue warnings to pregnant women through Public Service Announcements (PSAs) on the TV & radio and that they issue a news release. Carefully document their response. Make a formal request to address the board of your local WIC program as they specifically cater to pregnant women (see NYC WIC). Again, document their response. Email FAN’s campaign director Stuart Cooper for advice and help. Let him know that you are part of this campaign. Can you think of any other ways we can get this important message to pregnant women? We need your help and we need your creativity. Can you design a poster, a billboard or a small advertisement for the local paper? Please stay tuned, there’s more to come!